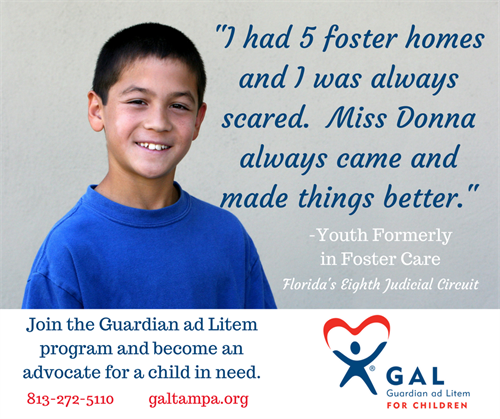 If you are interested in learning about how you can become a child advocate here in Hillsborough County or you just want to learn more about the Guardian ad Litem program, please join us at this weekly Information Session. Our team will share the mission of the Guardian ad Litem program, more about the children for whom we advocate, and how our volunteers make an impact in the community. We host the Information Sessions weekly at various locations throughout Hillsborough County. Please visit our website at www.GALTampa.org to determine the location of this week's event.